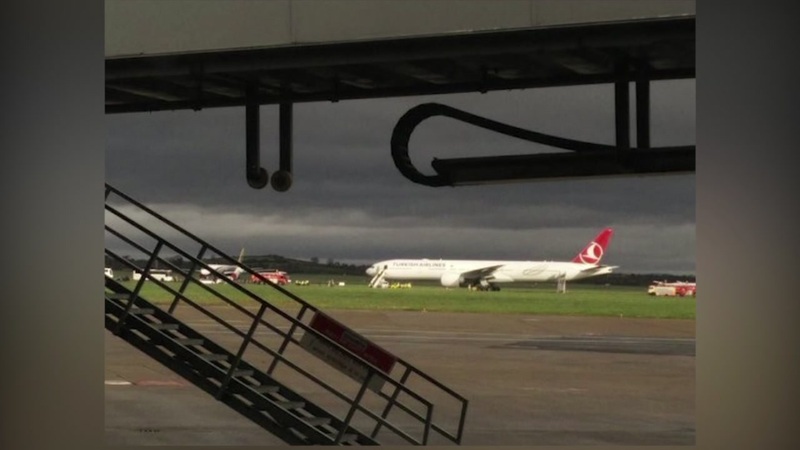 The Turkish Airlines flight was kept at a distance from an Irish airport as a precaution. SHANNON, Ireland (KTRK) -- Investigators say no explosives were found on a Turkish Airlines flight from Houston to Istanbul. Turkish Airlines Flight 34 was was diverted to an airport in Shannon, Ireland after a handwritten threat was discovered upon the plane as it crossed the Atlantic Ocean. The aircraft was met by police and a bomb disposal unit, according to the Irish National Police Service. Authorities say a search of the Boeing 777 revealed no explosives were found after someone found a note in the bathroom. The note simply said "bomb" on it. The plane was taken to a remote taxiway. Airline officials said the flight will continue to Istanbul. At the time the flight was diverted, there were 207 people on board, including two infants.